Scattered around the country and several places abroad, we can meet monuments, memorials etc. telling a number of stories of the uncounted numbers of Danish officers and sailors, from the Navy and the merchant Navy, who lost their lives, during war times and peace. Not all sailors, however, lost their life at sea, most of them, even most of those we call heroes, died at home from natural courses. Fortunately we can also find a number of memorials, telling the stories of these brave men and women. This section will try to list most of these naval monuments and memorials. 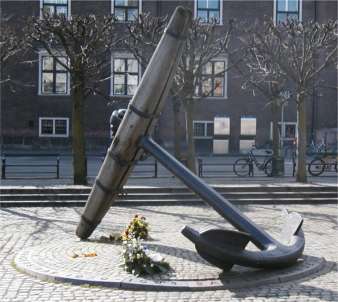 One of the memorials known to most Danes and tourists visiting Copen-hagen is the Memorial Anchor, or in Danish Mindeankeret, in Nyhavn, close to the Royal Theater in Copenhagen. However, how many of the local or foreign by passers ever speculated, why there is an anchor placed just there! The inscription printed on the stones actually tells the story; in remem-brance of the more than 1,700 sailors who last their lives in Danish or Allied service during the 2nd World War. Sailors, who died, in an attempt to liberate their country. Right in the center of Copenhagen you will find Holmens kirke, or the Naval Church. This church to day stand as a living monument on Danish Naval History. The building were originally constructed as an anchor smithy by King Frederik IInd back in 1562. The smithy was placed, at that time, in the center of the Danish naval base and dockyard. 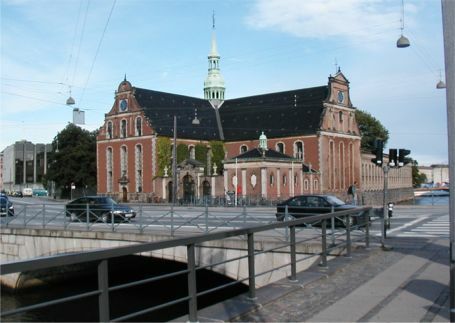 The old smithy was inaugurated as a church for the naval personnel in Copenhagen by Christian IVth in 1619. The long and low burial vault along the canal was built in 1709. This burial vault is the burial site of some of the greatest Danish naval heroes, like Niels Juel, Peter Tordenskiold, Carl Wilhelm Jessen etc. The present look of this church was given in 1872 through a major restoration. At that time the statue of Peter Tordenskiold was revealed in the yard. Through centuries the Holmens kirke has been the places were most new naval officers have been baptized and later had their confirmation. Later on, quite a number of the officers were married here. A number even ended their career in this church, passing by Nyboder on their last tour to the Holmen's churchyard. You can not find any complete registration of the naval memorials and monuments in Denmark. The purpose of this section is therefore devoted to the vision of registering most of the memorials and monuments in Denmark and abroad.